I recently picked up a secondhand Olive O4HD music player. It's an all-in-one device which rips, stores, and plays back music CDs. Mine came very inexpensively as it was acting up for the original owner. The player would reportedly lock up after running for some time. It seemed reasonable to me that the problem could be fixed with some tinkering. In order to get inside the unit I had to remove two tri-wing screws on the back. There are two flat flex cables connecting the motherboard to the front display. These cables do not have a lot of slack so the top should not be slid forward too much while removing it. An initial inspection of the hardware didn't indicate any problems. All of the components visually appeared to be in good working order. The power supply was my initial suspicion as to the souce of the problem but it looked immaculate. Probing it with my multimeter showed stable voltages. Everything passed the sniff test so I moved on. My next order of business was to image the included 2TB Western Digital AV-GP hard drive. While researching the Olive players I discovered that it is exceedingly inadvisable to use the manufacturer's recovery software on hardware that had been upgraded to version 4.3.2 of the operating system. Since mine had, an image of the disk would give me a recovery path if something went wrong. 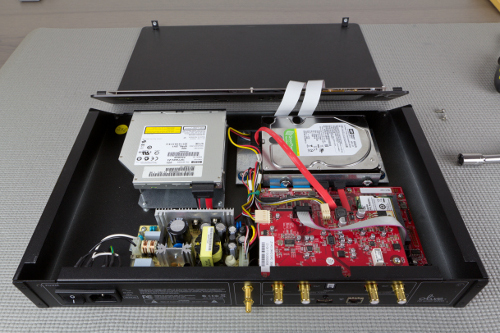 The hard drive is mounted onto a carriage that rests on four vibration dampers. I removed the four screws holding the carriage down, unplugged the drive's SATA power and data connections, and lifted it out of the player. As I imaged the drive I got my first hint at what might be causing the player to lock up - the hard disk would occasionally freeze while I was reading data from it. The issue was sporadic enough to allow me to create a fully image without issue. I selected a 2TB Western Digital Caviar Green drive as a replacement. The drive has nearly identical characteristics while using fewer watts. 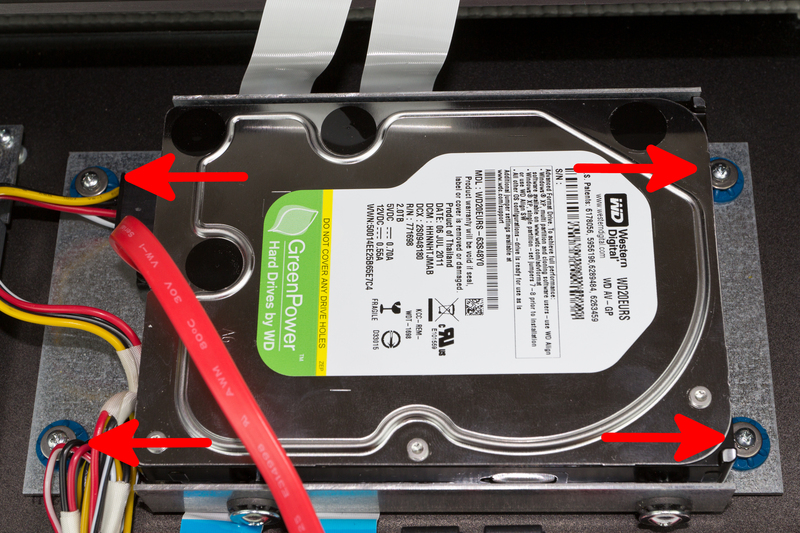 This is an important consideration for a drive that will be placed in the unvented chassis of the player. I performed the job simply enough with dd. While I had the new drive connected to my computer I ran fsck over the paritions. This is apparently not done with any regularity by the player on any of its ext3 file systems. All paritions are mounted by the player as read/write rather than the more traditional read-only in embedded systems. A consequence of this is normally powering off the player can result in some peculiarities. fsck found and corrected several problems. After cloning the hard drive I placed it back into the player and put everything back together. The player started up successfully and has been working well since. I highly recommend the ongoing thread on avsforum.com for information about the Olive players.